Gusto’s polpette meatballs in housemade tomato sauce. 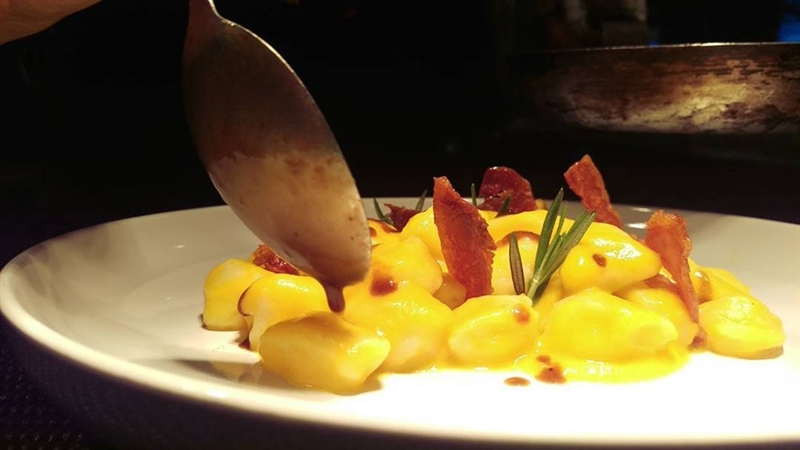 Fresh “made at the moment” Tortelli. Fresh pasta. Baby octopus “alla buzara” (slow cooked). For a taste of Northern Italy without leaving Ettalong Beach, head to Gusto Italian Bistro on Ocean View Road. This is not your normal Italian ristorante - a sleek and vibrant colour scheme makes for a cheery entrance as guests enjoy a cheeky cocktail, imported wine or beer at the bar – before an intimate dinner at small tables in front of a crackling fireplace in cooler months. Whether dining from an ever-evolving menu or partaking in the cicchetti tapas buffet, expect dishes such as sautéed mussels in white wine broth, chilli and paprika croutons; while pasta lovers can twirl a fork around fresh housemade black tagliatelle with prawns and lime. For the main affair be enticed by plates like char-grilled beef fillet, rocket, cherry tomato, Parmesan flakes and balsamic vinegar reduction. Delicious authentic Italian food; casual yet served with flare - The plates that chef Chiero brought us were both beautiful to view and delightful to eat. I enjoyed the most tender octopus, the freshest pasta with a perfectly matched Prosecco. Simple (as the Italians might consider it) but very very special. The restaurant too is cosy, intimate and far from street noise, in fact a little hidden inside Ettalong Marketplace, but worth tracking down. And the waitress, well she was just cute as a button. All-in-all a wonderful dining experience.